Ivey Abitz has been creating bespoke clothing since 2006. Here are just a few of the reviews we’ve received from customers. We treasure each and every customer, and we love seeing Ivey Abitz clothing in their lives. If you would like to share some photos or your story, please contact us. 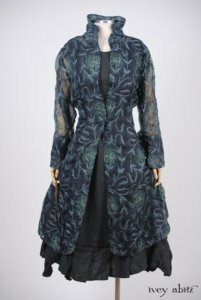 Morningside Duster Coat in Blue Slate Embroidered Silk Organza; Inglenook Frock in Blue Slate Washed Linen, Low Water Length. Thank you, Cynthia, for all the time you’ve taken with me and most of all for creating the most beautiful clothes I’ve ever seen. I do love this collection very much. It speaks deeply to me. I think there is something so very intrinsic to the heart about this collection. I love all your collections, but this one particularly resonates with my deep rooted sense of home and family. There is a very rich energy that abounds in my spaces shared with those dear to me that has been created through loving memories and activities. The theme and fabrics of this collection reflects these feelings. You have outdone yourself yet again! How do you do it? Carolyn (Hennesy) has looked stunning in all her Ivey Abitz ensembles that you have shown us from the Emmys and recent events. I am especially impressed by the colors chosen to so beautifully complement her hair and complexion. Her photos have really demonstrated to me the personal attention you bring to your design work. Carolyn and I are such different looks, and yet you have created unique and flattering wardrobes for each of us. And we are only two of many clients. I don’t know how there enough hours in the day (and night) to work with so many women on such different looks, with such grace and patience while your business just seems to be exploding, and all while doing a hands-on restoration of an antique home and studio. It is greatly appreciated. It is difficult for me to describe how your bespoke clothes enrich my daily life. I can no longer even imagine having to try to fit my short, curvy self (which I quite like!) into standard sized, off the rack clothing. Clothes that begin with the idea they are individually created to fit the woman, instead of vice-versa, are a luxury I would wish for everyone. 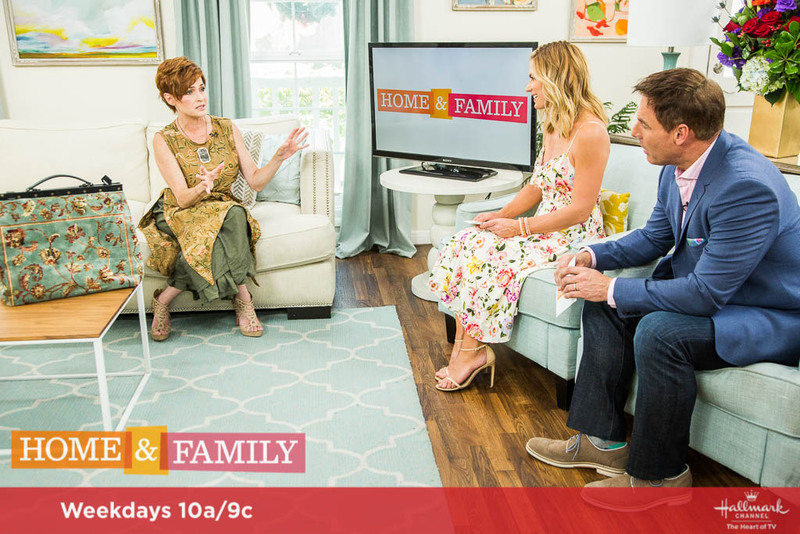 Emmy winning actor Carolyn Hennesy showcased her new Ivey Abitz bespoke ensemble along with tin type jewelry handmade by Carolyn herself during an appearance for Hallmark Channel’s “Home and Family.” Show aired 7/7/17. Carolyn’s Ivey Abitz bespoke ensemble includes the Dennison Frock in Birdsong Embroidered Silk with a pair of Blanchefleur Trousers in Meadow Yarn Dyed Cotton from the recent Spring 2017 Collection. 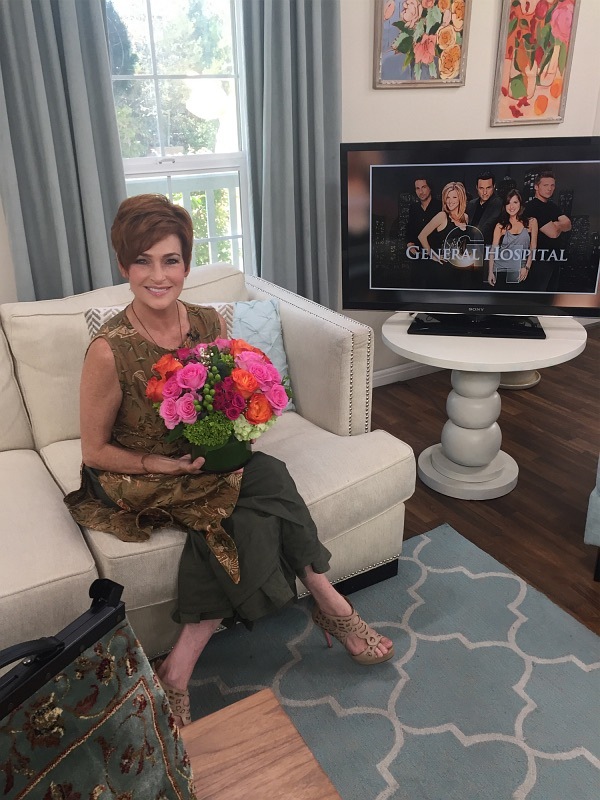 Carolyn Hennesy Wears Ivey Abitz in her appearance on the Hallmark Channel’s program Home and Family July 7, 2017. Photo courtesy Carolyn Hennesy. In this clip of the Hallmark Channel’s Home and Family, Carolyn appears with the cast of Fame – Debbie Allen, Erica Gimpel, Lee Curreri and Carlo Imperato – and cookbook author Nguyen Tran (he made some killer noodles on the program). Karen wears her bespoke Ivey Abitz wardrobe daily. A relative newcomer to Ivey Abitz, Karen has been watching the new collection debuts over the past year and finally decided to begin her Ivey Abitz wardrobe during the Fall/Winter 2016 Collection. Her collection now has frocks, a cardigan, and dusters to mix and match, and she plans to add her favourites from the upcoming new collections. The following is an excerpt from a lovely handwritten note that Karen took the time to write us. The Canterbury Duster Coat arrived this week and I was so excited to receive such a beautiful garment. I feel like a queen! It’s the most beautiful coat I have ever worn. I wore it Friday night on a date and at the end of the night the gentleman asked me out again for the next night. I can’t help think that my very romantic duster had an influence on being asked out again, and we have arranged more dates for the future! My daughter Emily was all smiles upon trying on my duster. She appreciated all the beautiful work done on it! I told her that maybe it will be part of her inheritance someday. Thank you for making the world a more lovely place one garment piece at a time. I do believe you were called by the Divine to do this work! 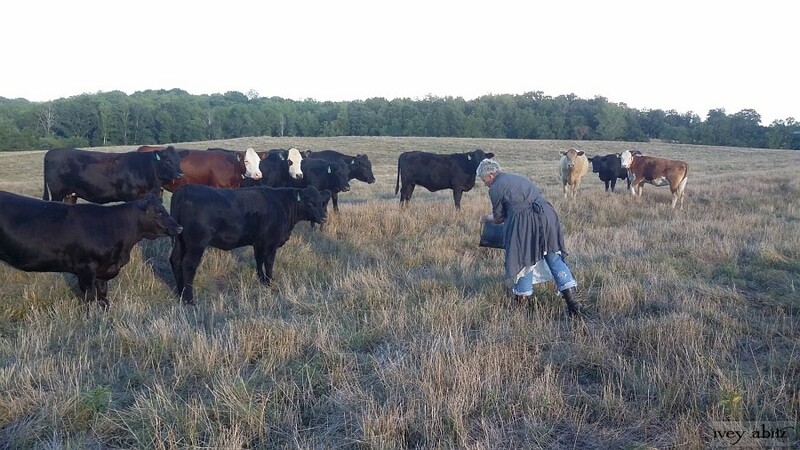 Read more about Karen from the Midwest at the Ivey Abitz Blog. My Phinneus Coat Dress arrived today. My fingers brushed its material as I pushed aside the tissue paper wrapping. I was immediately compelled to grasp the beautiful and surprisingly soft steel gray bundle without unfolding it and hold it against my cheek, relishing in its coolness. I let the fabric flow over my hands as I unfolded it and gazed upon my very first Ivey Abitz creation…sigh…..I am truly blessed. Thank you. NOTE: We love that Leslie works her farm wearing Ivey Abitz. Do not be afraid of wearing Ivey Abitz clothing while you work. Read more about Leslie at our blog. This summer’s collection has really been FULL of treasures, and I know that I will be treasuring my summer wardrobe for many years to come. In Southern California these are really year round clothes! Thanks again for your wonderful designs and your wonderful team. I know that behind the lovely clothes that arrive on my doorstep are hours of thoughtful consideration of fabrics, design, and loving handwork on many people’s part. Read about Jean’s visit to the IA studio and what connects her to the Ivey Abitz aesthetic. 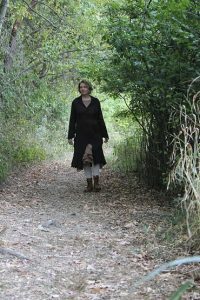 Here’s a link to Jean’s blog and the article, The Dressmaker’s Studio. And don’t miss Jean Zimmerman’s many wonderful books centering around the history of New York City. Of course, I have been eagerly awaiting my new packages and was thrilled when they arrived today. All are perfection and fit like a dream. I feel as if they have been part of my life all along. It is a very interesting phenomenon, and I think it is because they are so perfectly attuned to my personality. The wonderful Evie Frock and Dress arrived yesterday, and I tried them on under Sabrina’s [her dog] watchful eye (Lila Rose [her cat] has quit her job as the clothing try-on supervisor). I LOVE, LOVE, LOVE them! I know your description said the hem had extra movement built in, but that was positively British in its understatement. The way it flows and bounces is so lively and beautiful, I’ve never seen anything quite like it. It occurred to me that the Evie wags its tail! Frances from California wearing her Ivey Abitz. Read her full Ivey Abitz story. I just received my order and tried everything on. I am speechless and teary-eyed!!!!! Everything is so beautiful! It’s what I expected, hoped for, and so much more! Thank you so very much! I so appreciate the beautiful garments and your amazingly artistic talent. You seem to outdo yourself with every upcoming season. I took your advice and submitted my order right away so I could be at the top of the sewing list. I’m super excited to receive my order in time for my vacation. It’s going to be so fun to be traipsing around France in your beautiful creations! Thank you again for your thoughtfulness.. It has been a joy to discover Ivey Abitz clothes. The whole experience is fantastical and beautiful. Cozy, comfortable and beautiful. A lovely black knit that looked perfect on stage! I’ve come to expect that everything I order from IA will be cause for excitement. 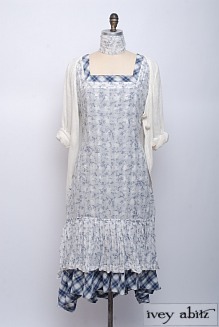 Not only are the clothing items fabulous at Ivey Abitz, so is the customer service. I was blown away by the exceptional quality, attention to detail and point of view of the ivey abitz pieces. I got my first compliment within a minute of getting out of my car in a parking lot. Read more detailed client stories at the Ivey Abitz Blog.